It was a casual match and our playing bubbies, long-time friends of Eric’s, Andy and Jeff, started teasing him about his low driving style. It’s amazing how his powerful strikes could sometime produce 270-280 yards drives that only went 10 feet up in the air. I’m sure you understand his tee-shots rolled forever. In the middle of the round, Eric gave his poor golf ball one of his characteristic mighty blows. Only this time, it was a little too close for comfort. We heard a thump as the ball violently connected with the lady’s tee-marker, 15-20 yards in front of us. We all held our breath for a few seconds…not exactly knowing where the ball was going. I even put my hands on top of my head to protect myself. Then we were relieved to pick-up another sound, more cushiony, behind us. His ball had traveled more than 50 yards backwards and landed just in front on the previous green. Eric was too embarrassed (and believe me, he wouldn’t strike you as the shy type at all) to go play or even retrieve his ball. It didn’t help that everyone was giggling, even the guys from the group behind. He finally decided to simply leave it there and took a well-deserved Mulligan. Afterwards, replacing the helpless wooden tee-marker that took a real betting getting yanked off the ground and almost splitting in two, we noticed a couple extra sets of dimples embedded in it, so it wasn’t its first encounter with a low-flying-fast-traveling object. We went on kidding it probably was Eric’s highest drive ever and had a lot of fun during that whole round. It continued thru the night but that’s another story by itself. The venue surrounding the first tee of my teen-years home course was a particularly fertile environment to provoke those kind of dangerous-deflection incidents. The elevated tee perched in the side of a hill provided limited space for all sets of tee-markers and enticed players to adopt a low ball flight to avoid too much influence from prevailing headwinds. A large wide-trunked pine tree to the left front of the tee-box often made its presence known and sure brought additional complications. Standing around and behind that tee, you quickly learned to get your head down and sensible body parts protected. The traditional fore shout did no good because unfortunate instantaneous rebounds where too fast. To add to the problem, the parking lot and large glass windows of the club house were not that far behind. In those circumstances, some golfers truly became driving hazards. This unusual setup sure supplied its fair share of awkward situations over the years. Like when during a corporate tournament, a ball knocked into the frame of the main club house door just as the big boos was exiting. 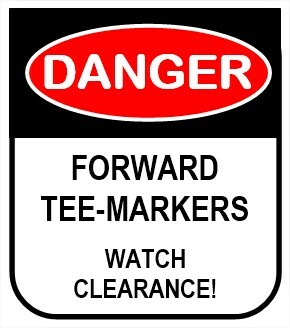 It was almost a catastrophe the year the club adopted reversed-glass cement tee-markers. I’m sure you can imagine all the funny yet potentially harmful possibilities. Bing! Bang! Bang! Ouch! Fortunately, improvements were implemented over time: trees and a cedar hedge were planted behind the tee to provide cover; an additional tee-box was built to the side lower down the hill. A accidental fire even burned down the old club house and it was reconstructed further outside the potential danger area. Even though hitting forward tee-markers can be considered a fairly common occurrence, a lot of people are puzzled to properly deal with the actual situation when it happens to them. Contrary to what many believe, you don’t get to replay a shot after hitting a tee-marker. Official golf rules decision-makers have decided to simply consider it a bad break and use their famous expression «rug of the green» to characterize and summarize the situation. So, they are essentially saying «tough luck» and remind players they will have to play the ball as it lies on their next shot. From our previous post, you may recall a similar ruling applies when Hitting a Flying Bird. Furthermore, a golfer will not be penalized for hitting a forward tee-marker with his ball. 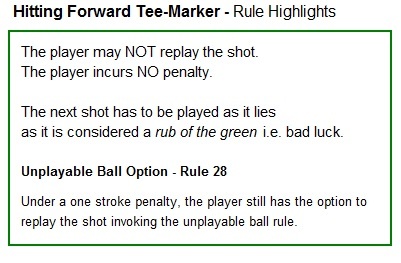 A penalty may only be imposed because of the ensuing bad ricochet on a tee-marker and where the ball finally ends up. For instance, you could get a penalty if your ball unluckily bounces out of bounds or in a water hazard. So you won’t get a penalty for hitting a tee-marker if your ball finished in the fairway, in the rough or even in the woods (if they are within the limits of the course naturally). Most fortunate golfers may get a birdie or even a sacred hole-in-one in the process. After hitting tee-markers, the ball will sometimes wind up in next-to-impossible spots, like in dense bushes. In those circumstances, the player may choose to invoke the unplayable ball rule. Accepting to receive a one stroke penalty, he would then have the option to play his next stroke from his precious position. For example, after an unfortunate tee-maker ricochet on his first shot from the tee, a resigned golfer could choose to re-tee playing his third shot. This option may actually help a lot and many times, it may be the only alternative you have to get out of very precarious locations. During our usual rules digging, we noticed several different rules involve tee-markers. Here’s a summary of some of what we discovered. For the first stroke, tee-markers are deemed fixed. Thus, if you decide to voluntarily mingle with them, you will expose yourself to some punishment. For instance, you will get a two-stroke penalty after moving a tee-maker that you considered to interfere with your swing. In a tournament, modifying tee-maker location will even grant you disqualification. There’s no penalty for moving a tee-maker by accident like stumbling on one. Strangely, you could even angrily dislodge a tee-marker by swinging at it with you club. It may not be considered proper golf etiquette but it will not result in a penalty. In all cases, dislocated tee-makers should be replaced. Now, what are your options if your ball stops right against a tee-maker? A tee-marker is defined as a movable obstruction after the initial stroke on each hole. Hence, the rules will permit you to move the tee-maker if it causes interference with your stance, lie or swing. The ball may be marked and lifted before moving tee-marker. Naturally, you should replace tee-marker after playing. Be extra careful with this related topic that can have quite lame consequences. Indeed, if you make the error to place your tee-ball in front of tee-markers (in fact, anywhere outside the imaginary 2-club length rectangle behind the makers), you will be imposed a harsh 2-shot penalty. But even more devastating could the outcome be, because you will be disqualified if you forget to correct your mistake before the next hole or signing your card after the last hole. Q.Under Rule 11-2, tee-markers are deemed to be fixed before making the first stroke with any ball from the teeing ground. Are tee-markers movable obstructions thereafter? Rule 11-2 states that before a player plays his first stroke with any ball from the teeing ground, the tee-markers are deemed to be fixed. Thereafter, Decision 11-2/1 clarifies that they are obstructions and if movable, may be moved (see Definition of "Obstruction"). 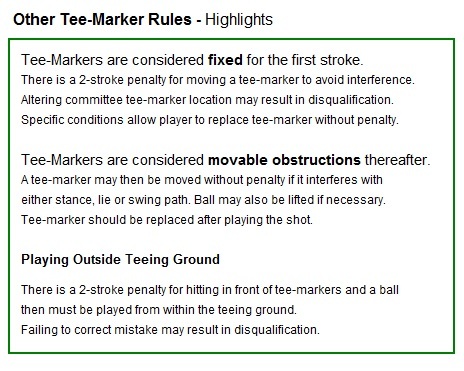 In view of the fact that tee-markers are initially fixed, and when moved can have a significant effect on the competition, the following are examples of the appropriate ruling in various circumstances. In all cases a moved tee-marker should be replaced. In some cases, the replacement of the tee-marker may affect the penalty to the player. (a) A player moves a tee-marker before playing his first stroke with any ball from the teeing ground because the tee-marker interferes with the lie of the ball, his stance or his area of intended swing - loss of hole in match play or two strokes in stroke play for breach of Rule 13-2. (b) A player moves a tee-marker before or after playing a stroke from the teeing ground because, in his view, the tee-markers are too close together, too far back, aimed in the wrong direction, or some similar reason - disqualification under Rule 33-7, unless the tee-marker is replaced before the player or any other player plays from the teeing ground, in which case the penalty is modified to loss of hole in match play or two strokes in stroke play. (c) A player moves a tee-marker before or after playing a stroke from the teeing ground as a result of falling over the marker - no penalty and the tee-marker should be replaced. (d) A player moves a tee-marker before or after playing a stroke from the teeing ground as a result of intentionally kicking it or striking it with a club - no penalty and the tee-marker should be replaced. (e) A player lifts a tee-marker before or after playing a stroke from the teeing ground for no apparent reason and without authority under the Rules - no penalty and the tee-marker should be replaced. Before a player makes his first stroke with any ball on the teeing ground of the hole being played, the tee-markers are deemed to be fixed. In these circumstances, if the player moves or allows to be moved a tee-marker for the purpose of avoiding interference with his stance, the area of his intended swing or his line of play, he incurs the penalty for a breach of Rule 13-2. That all from us for now! Be sure to join us again next time for another entertaining wacky golf fact chronicle!